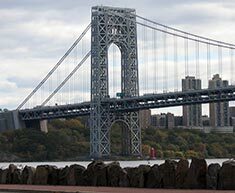 The Palisades Interstate Parkway provides a scenic 42-mile ride from the New Jersey side of the George Washington Bridge north to Bear Mountain State Park in New York. The 13-mile New Jersey section was designated as a New Jersey Scenic Byway in 2005. The New Jersey portion of this Byway is located in the Palisades Interstate Park that is approximately 12 miles long and a half mile wide in Bergen County. The Byway consists of the Palisades Interstate Parkway located on top of the cliffs and the Henry Hudson Drive located between the Parkway and the Hudson River. 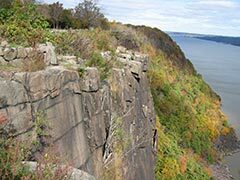 Three scenic overlooks are accessible from the Parkway and include Rockefeller Lookout, Alpine Lookout and the popular State Line Lookout, which is located on the highest point on the Palisades cliffs (532 feet). Several river access points are available from Henry Hudson Drive and include Hazard's Ramp Public Boat Launch, Ross Dock Picnic Area, Englewood Picnic Area and Boat Basin, and Undercliff Picnic Area. The park also includes hiking trails, a nature sanctuary, historic sites and the Fort Lee Historic Park providing information on the significant role Fort Lee played in the American Revolutionary War. Scenic views are one of the Palisades Scenic Byway's greatest assets. The Palisades are a unique geological feature that has attracted visitors for generations. Whether from the Palisades Interstate Parkway at the top of the cliffs or from the Henry Hudson Drive at their base, visitors can enjoy spectacular views of the Palisades, the Hudson River and the New York City skyline. The design of the Parkway itself was intended to provide motorists with a scenic and aesthetic driving experience. 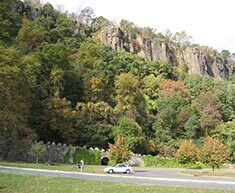 The Parkway was carefully designed as a road within a park, providing motorists with the opportunity to enjoy the beauty of the Palisades Interstate Park while minimizing impacts to the park's natural environment. Henry Hudson Drive was conceived as a pleasure drive to provide visitors with automobile access to enjoy the park and its outstanding views. The road was carefully constructed into the base of the Palisades cliff to deliver an exceptional scenic driving experience, which it does to this day. Beginning in 1900 with the formation of the Palisades Interstate Parkway Commission by Governors Theodore Roosevelt of New York and Foster M. Voorhees of New Jersey, the States of New York and New Jersey commenced a cooperative effort to acquire and preserve a large tract of the Palisades that was threatened by quarrying operations. Before this creation, all the Palisades had been in private hands, the lower portion along the river, consisting mostly of riverfront villages, the cliff top mostly either wood lots or the site of large summer estates. Although opposition for the Parkway was strong at times the development of the Parkway was supported by influential people such as John D. Rockefeller, who donated 700 acres along a 13-mile stretch at the top of the Palisades cliffs. The renowned master planner Robert Moses worked to establish the Parkway design and the best landscape architects and engineers were selected to develop a Parkway that exemplified the most innovative roadway concepts and engineering skills of the time. The history of both the Palisades Interstate Parkway and Henry Hudson Drive played a key role in national movements of the last century, from the rise of the conservation movement to the evolution of the automobile age.